It has become apparent from our weekly roundups that Amanda and I eat a lot of great food. To be honest though, I'm a creature of habit and I usually stick to the same old places. The Boy, on the other hand, is always on the food scene, trying all the latest and greatest restaurants - and taking some drool worthy snaps on his phone that trigger serious foodie FOMO in our friends. 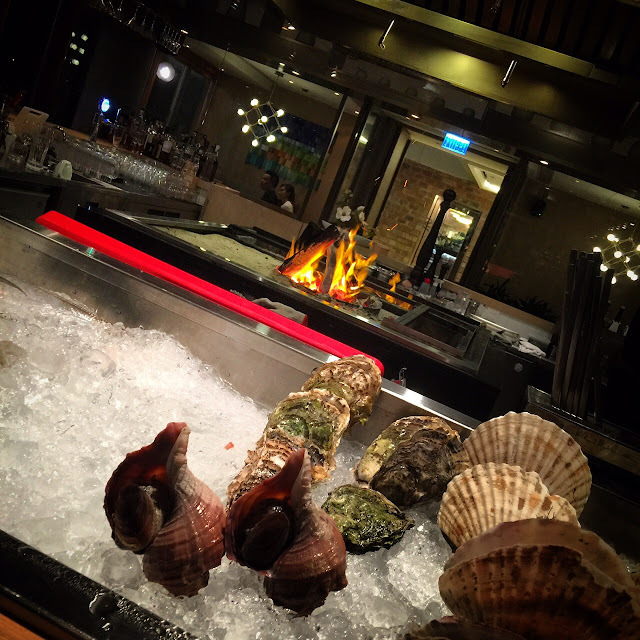 One of these new and hip spots we visited was Shoku, the Japanese restaurant in the upmarket The Pulse shopping centre in Repulse Bay. 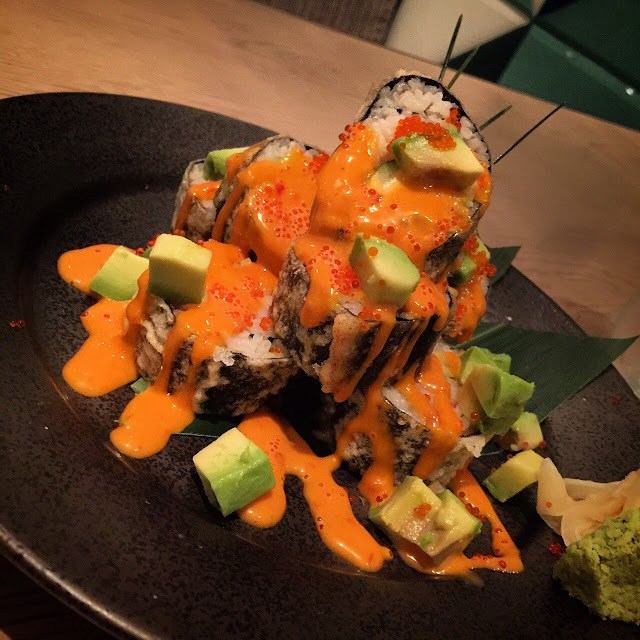 I'm a pretty big fan of Limewood, the restaurant nearby (see review here), so we went into Shoku with high expectations. We had the Shoku guacamole and shrimp salad (HK$128), which was very good. 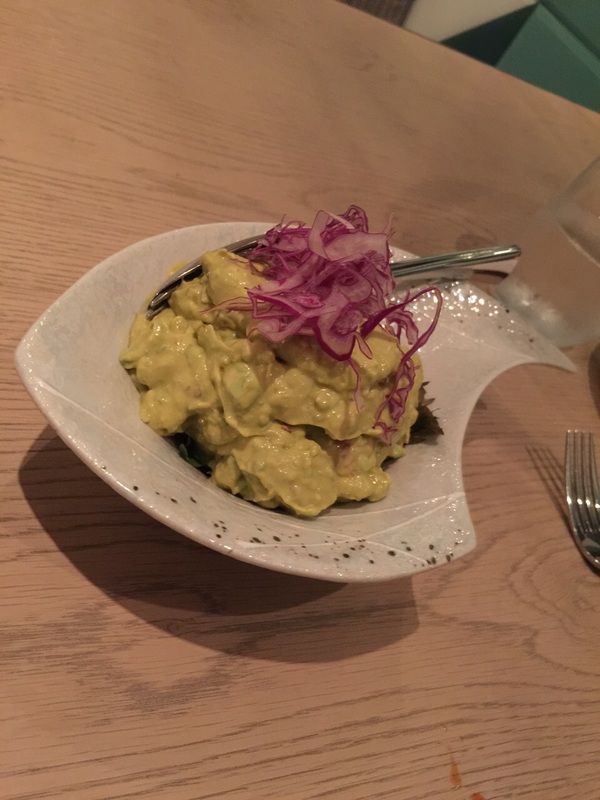 The guacamole was creamy and thick, and balanced with the slightly crispy lettuce and rocket. The shrimp was fairly subtle though, so don't expect giant chunks of prawn inside! 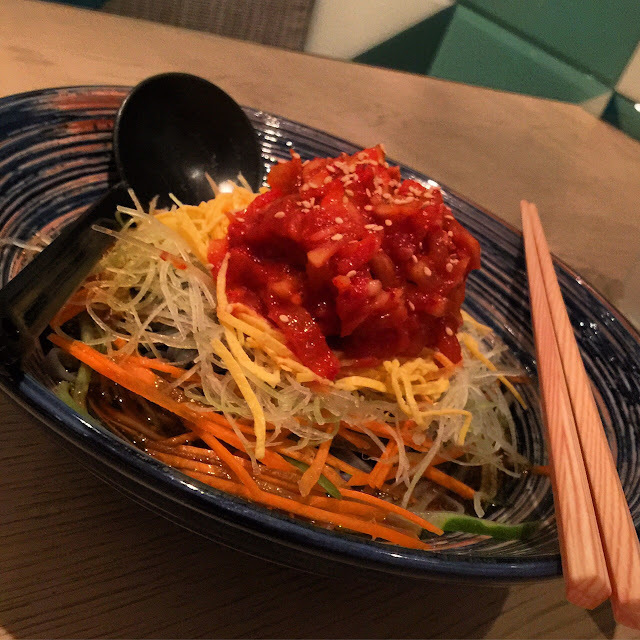 Then came the signature homemade kimchi Bichotan noodles (HK$198) that were served cold. The noodles were unexpectedly green and flat (as they are described as a type of udon noodle), and they had a smooth, slippery consistency that was well matched with the spiciness of the kimchi and finely chopped ingredients. The only thing that was slightly odd was that the sauce had formed a watery soup like base at the bottom of the bowl, which I don't think was intentional. Our two meat dishes arrived next. 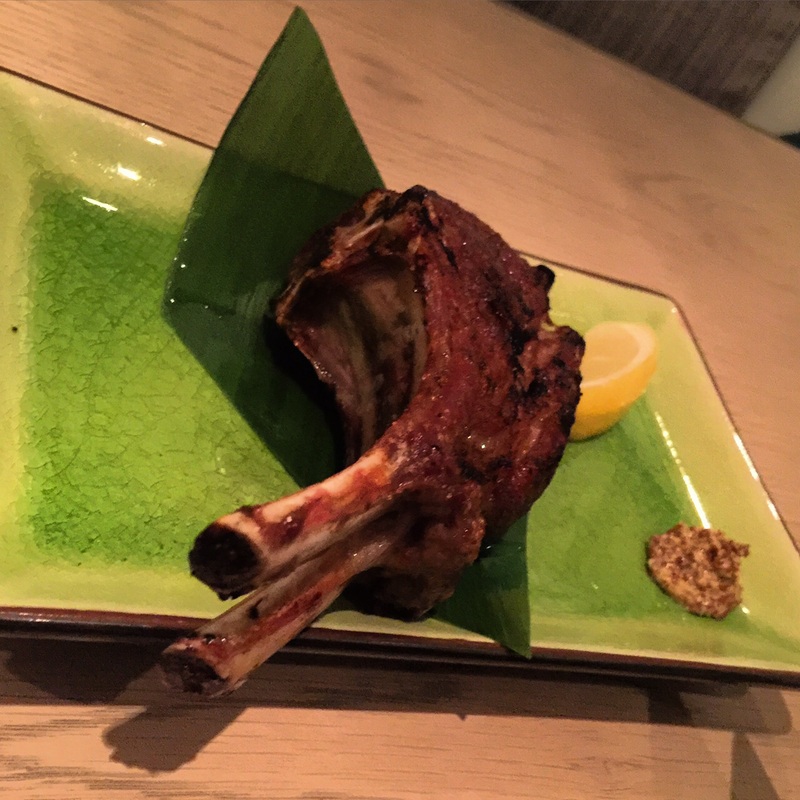 We had the Australian hormone free, free range and naturally grazed (yes, that's a mouthful) lamb chop on banana leaf with mint jelly (HK$138). It smelt good, with a hint of a smokey grilled scent. I'd recommend squeezing a bit of lemon on top for a citrus kick, which combined with the tiny dollop of whole grain mustard, has a beautiful flavour. Although there are two pieces of lamb chop, the portion size is not huge, so we were lucky to also have ordered the Prime Wagyu flat iron beef (HK$368) that was actually smoking when it arrived. 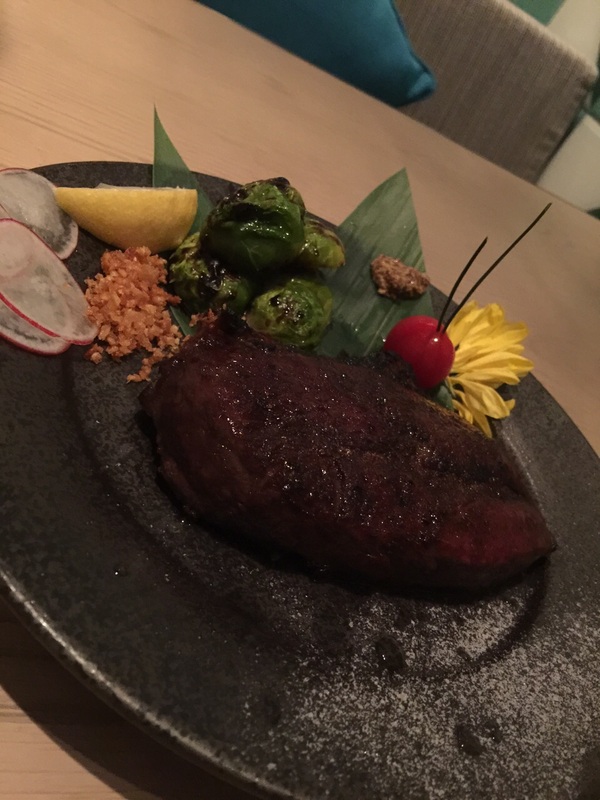 With a rich beef flavour but without the overly marbled meat, the wagyu was slightly tougher than expected on the outside, but with a smooth interior. The brussels sprouts were sweet, having been caramelised, and also had an interesting nutty taste. Finally, because The Boy was still not entirely full, we added a dish of volcano rolls (HK$168) that were lightly battered around the side. Despite not being a fan of fried things (or batter), I thought the rolls were excellent, especially with the spicy sauce. On a side note, I highly recommend their New Zealand Pinot Noir ($88) - reasonably priced, and fruity with a medium bodied finish.